Summer in the city (of London) and elsewhere in the UK has been unusually hot. To paraphrase a tabloid newspaper it has been a scorcher and continues to be so. Maybe nothing compared to Australian standards but this hot weather is sure to have had an impact on an already challenged retail market. I sense people haven’t been shopping as much although of course some summer goods such as soft drinks, outdoor toys, sun protection products, ice creams and drinks should have benefited. I know in my own experience that this in itself has caused companies problems. We have licensed Brand of Brothers for a full range of ‘frozen ice refreshments’ aka ice lollies based on Britvic Soft Drinks’ brands including Fruit Shoot, J20, Tango and R Whites. They have been working overtime to keep up with retail and consumer demand. Thankfully they have been able to meet the challenge but it is a lesson that successful licensing also needs well managed logistics and planning. There is a lot to be said for selecting the right licensees for their capabilities rather than their cheque book. Summer is traditionally a time when blockbuster films are released and this year there has been no exception with movies such as The Incredibles 2, Hotel Transylvania 3 and Jurassic World leading the way. Such films normally spawn licensing campaigns and promotional partnerships. In general terms licensees and retailers tend to be more wary of movie licensing . This concern is generally to do with consumer uptake on products and also the fact that the ‘buzz’ around a movie doesn’t seem to last so long – maybe because there is more competition. There have been some noteworthy products and promotions linked to these movies. Incredibles 2 has done well at the box office and has been well received critically. They have covered a lot of ground in promotion and product terms. They obviously had a weather forecaster on their team as one of the promotional deals they have done is with retailer Boots’ suncare brand Soltan. Consumers could get a free Incredibles drinks bottle with purchase. Good timing. Jurassic World was launched a bit earlier and they have activated a lot of licensing deals in categories such as apparel. One product highlight is a celebration cake – the cake has great on shelf impact and they have achieved a 3D effect with their design. A good example of re-inventing a standard category and using a film to spark fresh interest in the category. A partnership that has been very well timed in seasonality terms is a ‘collaboration’ between swimwear brand Orlebar Brown and James Bond. The upscale swimwear brand has dipped into the James Bond film poster archive and used poster artwork to create a range of swim shorts. The films and artwork have been well chosen including the iconic beach scene from Dr No. Both parties have used the partnership well with window displays, in store displays and PR to the fore. A really good example of a brand owner leveraging a well chosen license well but also the brand helping consumers to ‘see’ a licensed brand differently. This partnership could well spark more deals. Summer is also a good time to launch outdoor events. There is a move in licensing for more experiential partnerships. Aardman have been at the forefront of this and have invested in a live events team and trade marketing programme. One aspect of this has been creating public art trails. 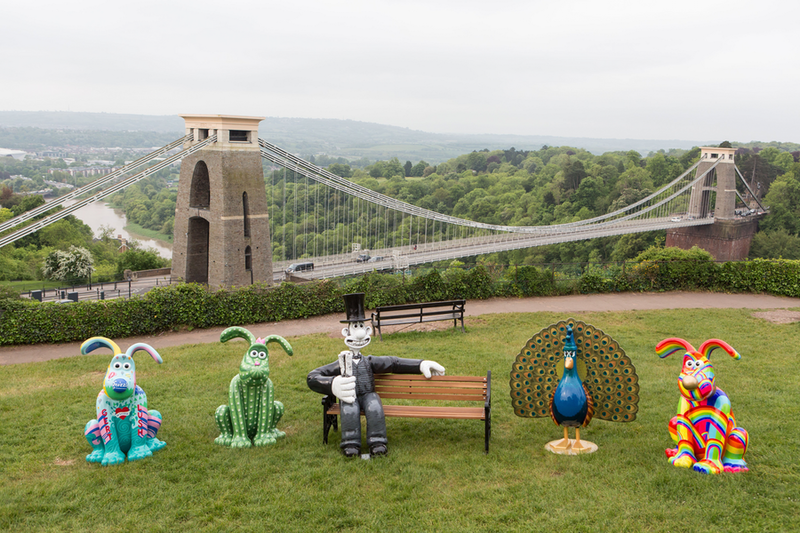 A new trail started this Summer in Aardman’s hometown of Bristol. Artists, brands and companies are inviting to design and decorate large scale versions of Wallace, Gromit and Feathers. These artworks are then displayed around the city along a trail that the public can follow. It is a really immersive event with lots of social media sharing. From a licensing point of view events like this create momentum and focus. Future Summers will undoubtedly see more movie blockbusters but I also expect to see more curated events where rights owners create opportunities for the public to engage with IP. I can’t close my whistlestop tour of the Summer without mentioning the Football World Cup. From an English point of view England did a lot better than anyone expected but ultimately football didn’t come home. Licensing didn’t come home either – most licensees steered clear of the opportunity it seems concerned about England’s longevity no doubt. However I am sure there were a number of licensing winners with sticker collection company Panini being a stand out performer. The World Cup was a lesson in the unpredictability of sport and how difficult it is for licensees to manage sports licensing. Maybe there are lessons to be learnt in terms of product planning and the ability to produce products locally. I wonder if online retailers and companies that produce personalised products did well from the World Cup being able to respond more quickly to events on the field. Summer presents good opportunities for licensing but like much in the industry at the moment there needs to be a more planned approach to business and a more flexible one – licensing needs to be able to respond to events in a more nimble way: rain, shine or semi final.